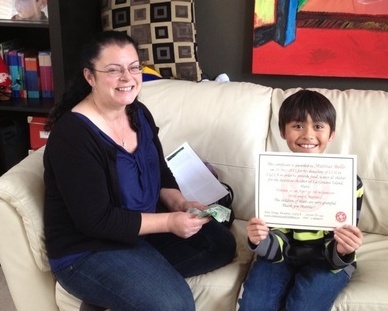 Young Mattias Bello receiving a certificate of appreciation from Ailsa Young, President of LGCCA on May 28 2013. Mattias donated his birthday money for the 2nd year to LGCCA kids…thanks so much for your generosity Mattias, you’re awesome! The $120 will help to provide food, water and shelter for some needy children on La Gonave Island, Haiti. This entry was posted in Uncategorized on May 31, 2013 by Ailsa Young. URGENT Appeal for Childrens Home!